There are no sales pitches in the new Age of the Customer. Today, the name of the game is “customer experience,” and the consumer is king. In fact, Salesforce’s third annual “State of Sales” report found that customer satisfaction is the number one measure of sales success. To win at selling, sales professionals must help customers to win too, by fostering a discussion that uncovers their needs and then proposing solutions that best fit them. 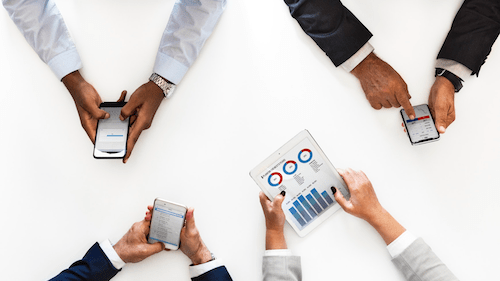 To deliver, sales teams are adopting new data-driven approaches, spending more time connecting virtually with customers, and breaking down the silos that prevent businesses from offering a connected experience throughout the customer journey. So, which trends define this new era of selling? 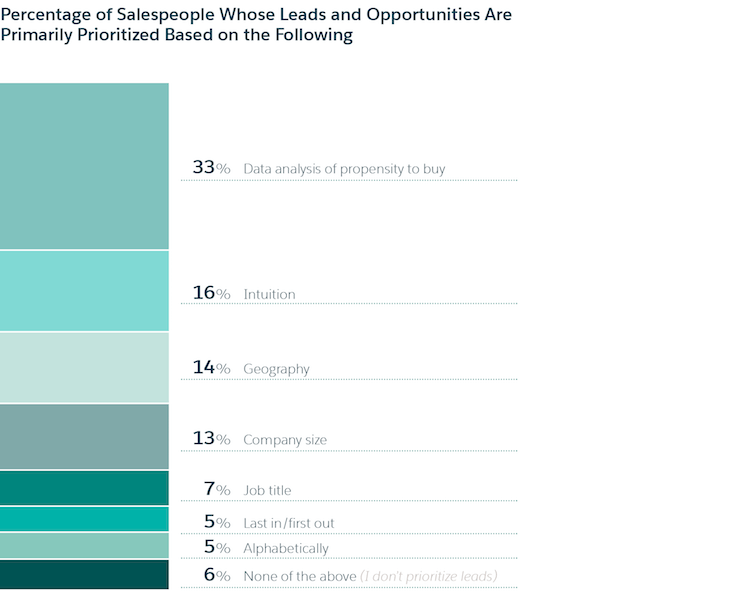 We’ve taken findings from our “State of Sales” research to map out 26 key sales statistics that highlight how the role is changing. Plus, we recap top trends from the previous report, which are still making their mark on the sales landscape. Together, they underscore just how much sales is evolving. Sales teams struggle to keep up with data entry, quote generation, and other tasks that take them away from customers. Unsurprisingly, 57% expect to miss their quotas this year. While customer satisfaction is a top priority for businesses, there’s no universal way for sales teams to measure their role in delivering it. Sales leaders are searching for ways to measure their team’s performance beyond traditional metrics. Sales reps will increasingly be judged on their ability to create and nurture high-quality relationships with customers. Key Takeaway: Success metrics are refocusing around customer experience. As tech-savvy customers continue to raise the bar for businesses, sales teams are on the front line. 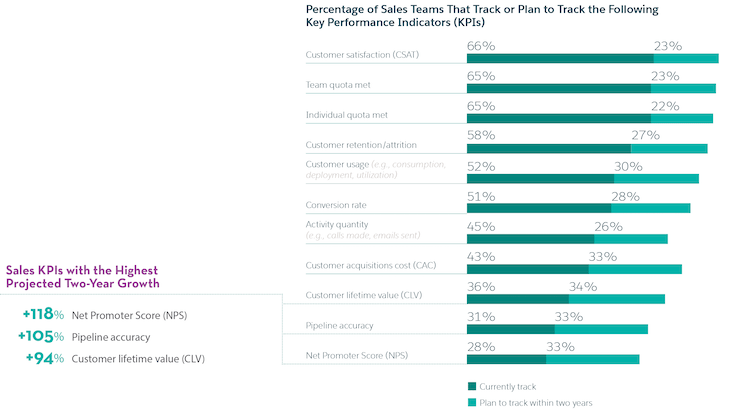 As Salesforce’s Senior Director of Product Marketing, Lynne Zaledonis, explains, reps are “increasingly responsible for emerging customer success metrics, adding a detour to their quota-driven north star.” This can be a tall order for sales reps, who may find themselves overwhelmed by administrative tasks — as these statistics illustrate. Data insights are emerging as the weapon of choice for many sales teams. However, more basic criteria such as company size and geography still have a role to play. Of the remaining teams, 34% supplement predictions based on intuition with data-driven insights. Only 16% rely on gut feeling alone. Conversely, underperforming sales teams are 1.7 times more likely to forecast on intuition. This is despite 85% of those who do saying it makes them more effective in their job. Key Takeaway: A data-driven sales book is emerging. Access to data insights is fast becoming a key differentiator for top sales teams. Being able to mine customers’ data for business insights gives sales teams a head start when it comes to prioritizing leads, forecasting, and building deeper customer relationships. 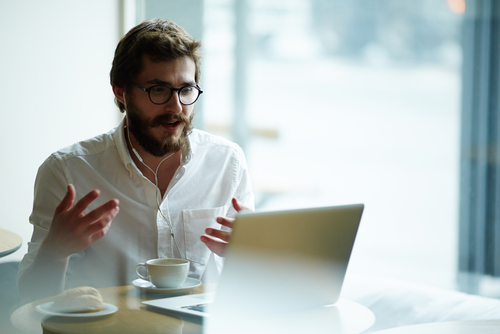 Sales reps have increased their time connecting virtually with customers at a rate 3x greater than connecting in person. As virtual selling becomes more common, businesses are rethinking staffing models. And it’s paying off, with high-performing teams between 2.3 times and 2.7 times more likely than their underperforming peers to have hired more inside sales staff. Key Takeaway: Virtual sales are on the rise. Rather than spending time traveling to meetings, reps these days are more likely to touch base with customers and prospects via video chat. Customers judge businesses on their performance as a whole, not on the performance of individual departments. This means connected processes such as seamless handoffs between departments and organization-wide knowledge of a customer’s sales and service history are crucial. However, a lack of integrated systems linking data sources is holding many businesses back. Currently, only 49% of businesses say they have fully integrated systems. High-performing sales teams are 2.1 times more likely than underperformers to have these systems in place. Collaborative selling requires sales, marketing, and service teams to be aligned through shared data sources, goals, and metrics. Sales teams need to be aware of marketing campaigns, understand which ones resonate with customers, and crucially, why they are receiving a lead. Salespeople must also be aware of service interactions when dealing with customers. 12. High-performing sales teams are 1.6 times more likely than underperformers to say service reps proactively alert them to opportunities. Close collaboration between sales and service teams isn’t just integral to the customer service package; it may also lead to opportunities that might otherwise go unnoticed. 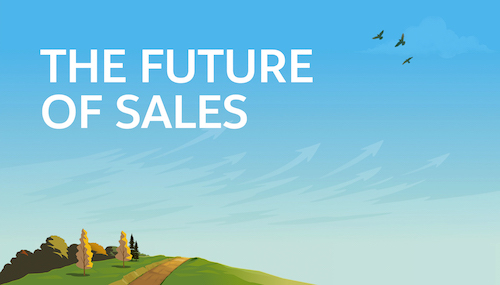 Key Takeaway: There is no place for siloed thinking in the new sales environment. The onus is on businesses to ensure that internal teams leverage a single, shared view of data from across the customer journey to improve customer experience and drive sales. Today’s informed customers have more power to dictate which businesses lead and which fall behind. Sales teams, unsurprisingly, are eager to crack the code on customer-centricity. The following sales facts illustrate the rising importance of customer experience. Top sales teams care just as much about creating long-standing, return customers through memorable experiences as they do about making the sale. By offering more personalized selling experiences at scale, top sales teams are winning the attention of customers who are tired of one-size-fits-all tactics. Customers now seek personalized interactions with brands, and expect their sales reps to learn, understand, and anticipate their needs — like personal consultants. As companies prepare for the intelligent marketplace of the future, successful sales teams are arming their reps with smarter selling capabilities. 17. 73% of sales teams say collaborating across departments is absolutely critical or very important to their overall sales process. Sales teams of all performance levels realize the importance of cross-collaboration to have complete visibility of the customer journey. Organizations are able to sell more quickly and efficiently by integrating other departments into the process. However, they’re having a hard time delivering with their current technology stack. Only 17% of sales teams rate their single view of customer capabilities as outstanding. 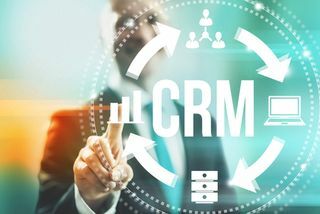 Sales teams not only have to keep up with the pace of mobile customers, but also update their customer relationship management system, manage the flow of paperwork between clients and legal, and await customer responses. Today, they are taking back control by reducing administrative inefficiencies with the help of automation, smarter analytics, and mobile capabilities. The following statistics show how sales teams are tapping into tech to work smarter. 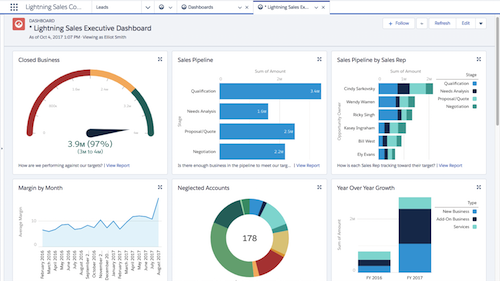 Analytics provides sales teams with deeper insights into lead quality and process effectiveness, resulting in more data-driven decision-making and greater visibility for sales leaders. Not only does analytics open the door to a more efficient, accurate, and personalized process, it also gives sales teams deeper insights to optimize their selling process. 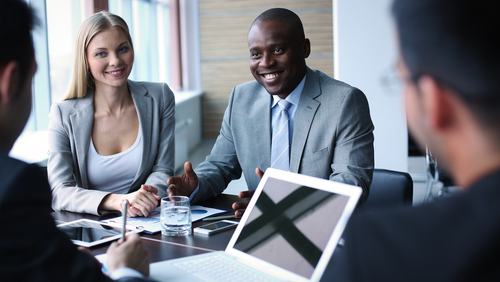 It’s estimated that U.S. companies spend more than $70 billion annually on sales training. Top teams understand training is vital to empower sales reps with productivity-enhancing technologies and ultimately better engage with customers. Reps are becoming bogged down with non-selling activities. But they’re turning to artificial intelligence (AI) for smarter selling processes that help them win back time and selling power. Top sales teams have already realized the power of using AI to craft compelling customer experiences, focusing specifically on automatically recommending products to customers based on their preferences. Soon, product recommendations, lead scoring, email responses, and even day-to-day administrative tasks will be autonomously integrated so that sales reps can focus on delivering the best customer experiences. 25. High-performing sales teams are 2.3 times more likely than underperforming teams to use guided selling. Over the next three years, sales teams at all performance levels anticipate that guided selling and coaching capabilities (that is, adaptive intelligence on next-best activities) will grow by 98%. 26. High-performing sales teams are 10.5 times more likely than underperformers to experience a major positive impact on forecast accuracy when using intelligent capabilities. Those who have implemented intelligent technologies are already seeing a payoff, realizing substantial improvements in areas such as prospect nurturing, forecast accuracy, and pipeline generation. 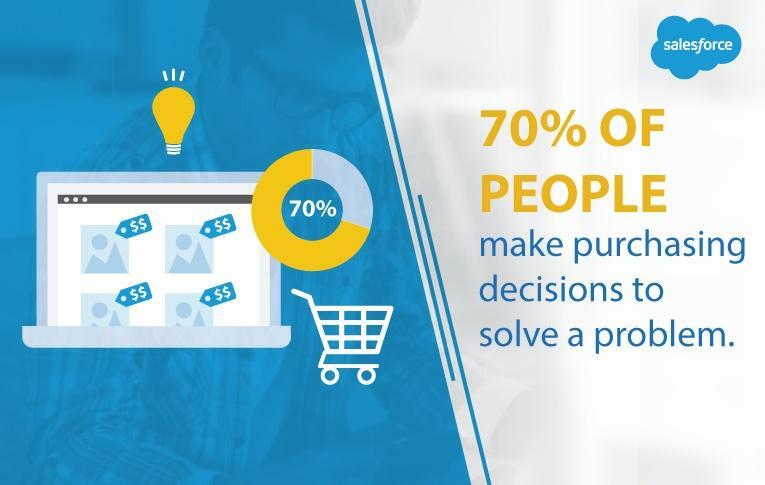 While top teams are already realizing the tremendous benefits of adopting smarter selling techniques, others stand to make substantial gains from spending time selling and connecting on a deeper, more personalized level with customers. For more interesting sales facts, get the latest “State of Sales” report, featuring country-specific data and research-based benchmarks for the modern sales team. Editor’s Note: This post was expanded from its original “15 Sales Statistics That Prove Sales Is Changing” to include new sales facts published in the third edition of the “State of Sales” report.